Nikolaos Tzifakis is an Associate Professor in the Department of Political Science and International Relations at the University of the Peloponnese, Corinth (Greece). He is also a member of the Balkans in Europe Policy Advisory Group (BiEPAG). The term Macedonia is a geographical term. There are no Macedonians who spoke Greek but lived on the periphery of the Greek world. Slavs who call themselves Macedonians and Albanians live in the north part of the ancient Kingdom, but they are not Macedonians. Greeks in the south, half of whose ancestors cam from Anatolia post-1923 and Constantinople. Before 1912 a majority in the south were non-Greek. They left or were expelled or murdered. Likewise with Thrace. There are no Thrace but East Thrace and Thrace exist. However Turks and Greeks live there. The answer is to make clear the name Macedonia is just a geographical term. The North ‘Macedonians’ admit this is the case and they have no connection to ancient Macedonia ethnically. The Greeks should be satisficed with this. It’s reality and the truth. This is not quite the case. The (North) Macedonian’s official concept of their identity is that they are not entirely a Slavic people because the Slavs did not simply eliminate the people who’s land they settled in the 6th C, these lands were not empty, but they mixed, or assimilated, forming a new Macedonian people. They took the name of the land they were on and the people they assimilated, this is certainly not unusual behaviour. It is hard to either prove or disprove this thesis, as it is also hard to ‘prove’ that modern Greeks bear any resemblance to the ancient Greeks, but no-one takes from the Greeks their idea of themselves. Neither should anyone take the right of Macedonians to identify as they wish… unless it can be categorically (and independently) proven to be wrong. The way I see all of this is that the Greek long term strategy of denying Macedonians an identity is because of the terrible crimes they committed in the region post 1913, and still they deny the existence of their Macedonian minority. The western democracies should have stood with Macedonia on principle rather than bulldozing it as they have done. 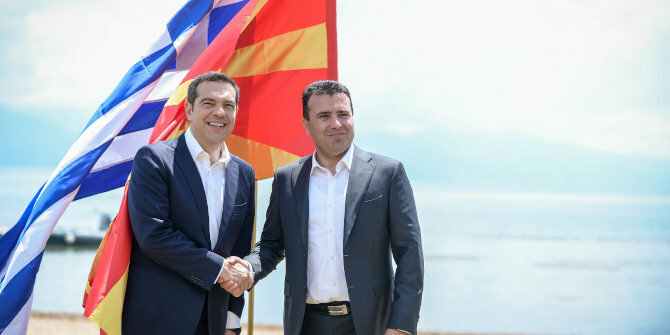 This does not sit well in (North) Macedonia and could well lead to further trouble, which could have been avoided by simply telling Greece to behave according to international law.